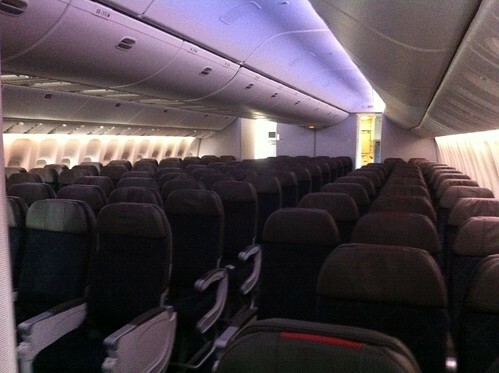 I’ve already posted photos of the First Class and Business Class cabins from American’s new 777-300ER, so here now is a look at the Main Cabin. 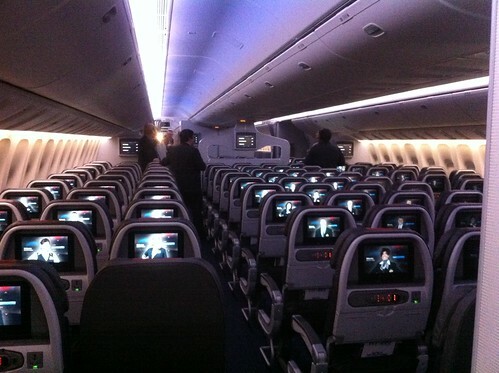 30 Main Cabin Extra seats in a 3 x 4 3 configuration. 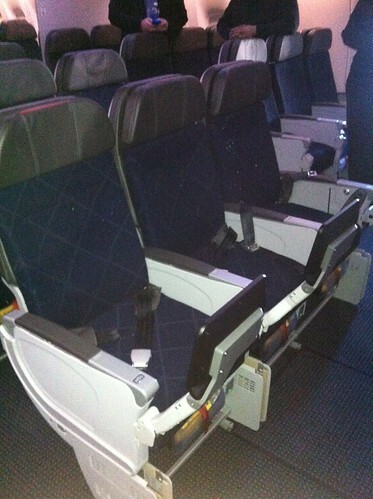 214 standard economy seats in a 3 x 4 x 3 configuration. Lots of extra room in the forward mini cabin. 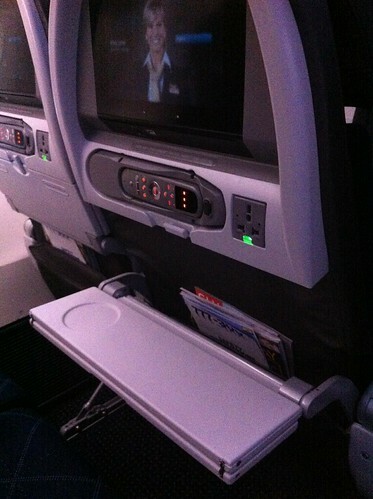 Seat pivots so that you slide under the seat in front of you rather than into the seatback. 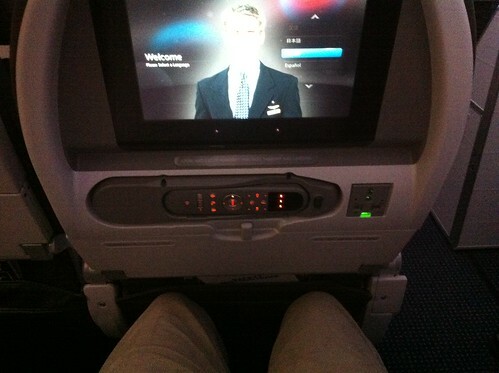 For economy, it’s not bad. 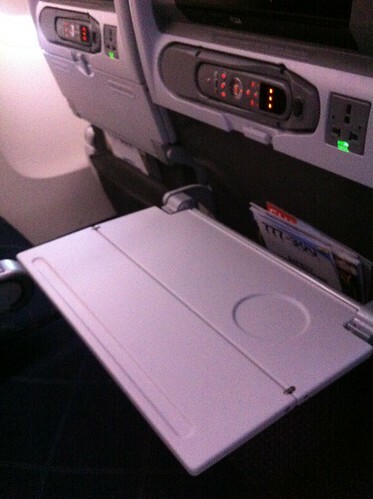 Seatback tray – partially extended. Nice screen size. More than 120 movies, 150 television programs, and 350 audio program available on demand. Video games, chat, or connect your own device and watch or listen to your own movies and music on the system. 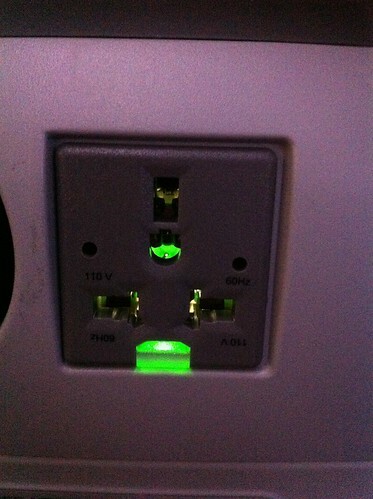 USB and Audio Video Ports. Motion sensitive panel illuminates USB and Audio/Video ports when it detects motion near the screen. Not quite as nice at the premium cabin bathroom, but at least it doesn’t have a push button faucet: I’ve never mastered washing my hands while pushing the buttons at the same time! Curved luggage bins and lighting make it look large and roomy. 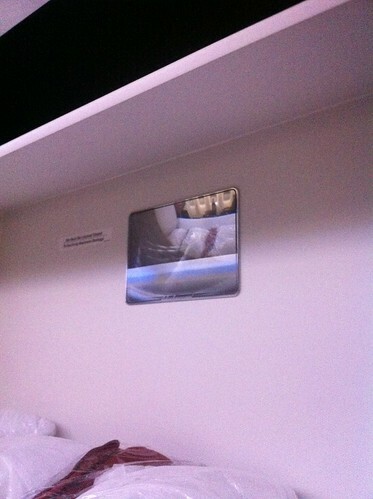 The overhead luggage bin has a mirror to help you see inside so that you don’t leave anything behind. 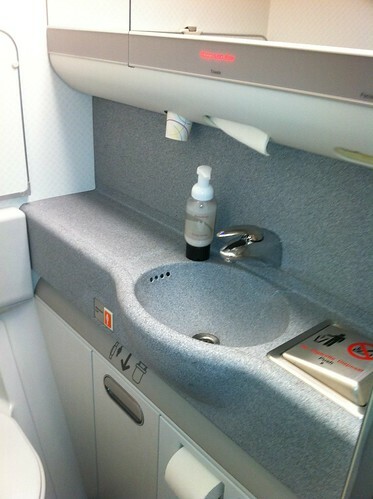 Just another example of the thoughtful design decisions that American made with the 777-300ER. Thanks for the sneak peak. 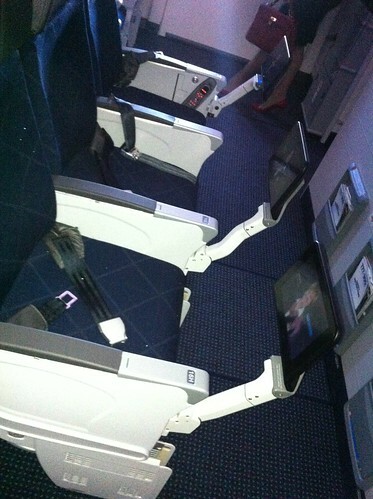 Wish they were flying these to Asia though. Few comments, wish they used some lighter fabric, the navy is drab and it really looks like cx cabin from many years ago, including remote. I like the remote. Even though touchscreen mobile phones and pads are prolific, too many people have yet to understand that it’s a “touch” screen, not a “slam-your-finger-into-the-back-of-my-skull” screen. Thanks for the pictures. I think the MCE section is actually 3-3-3, main cabin is 3-4-3. I think both of your MC photos are actually MCE. 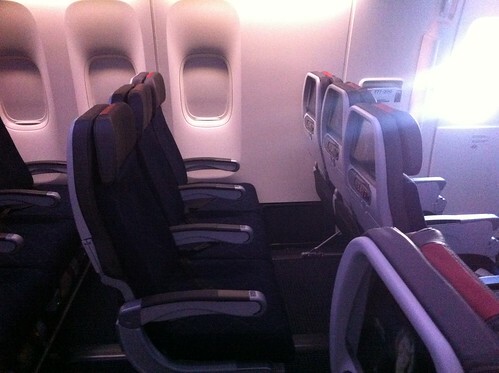 They both show the 3 seats in the center. 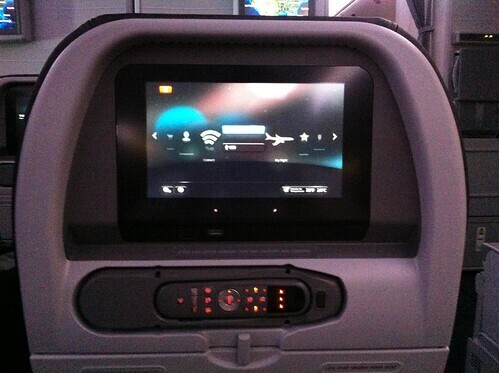 I’m on a 777-200 tonight LAX-LHR. The bumped me to 1st! Sweet. Thank You very much for the photos! @ Dave – You’re right, I didn’t catch that until you pointed it out. Woo hoo!! Enjoy the bump up to first! In addition to the upgraded meal service, I heard a rumor that they just introduced new glassware last week. Let me know if it’s true. Enjoy the trip and safe travels!! 7? 7? 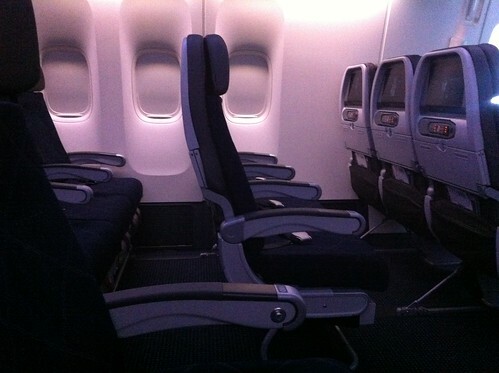 oh lord help any of us that loose those biz seats, I will never work where I am booked in AA economy, I dont care how much leg room is in main cabin extra! IF they ever forced me into 7 across, I will leave that job!! My wife is traveling from ORD to LHR this Sunday (April 7). I am trying to figure out if she is going to be on one of the new plans or an older one. 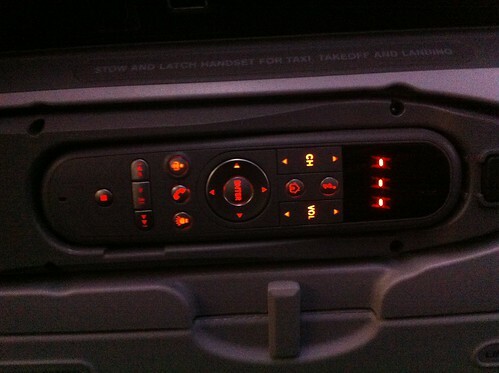 The reservation states it’s a 777. The picture in this post (and others) seem to show the new plans are called 77W? Is there hope or is she definitely on an old plane? Thank you. @ Chris D – Awesome!! Hope you had a great trip!